How to Feed a Yorkie? Yorkshire Terrier December 15, 2018 April 12, 2019 No Comments on How to Feed a Yorkie? If you are keeping a Yorkie appropriately feed, it is the most important part of taking care of the dog. The quality of food that you feed your dog has a direct effect on the dog i.e. effect on its health as well as its behavior. There are some stages of a Yorkie’s life and it is very important to have the correct knowledge of the different stages and food requirements accordingly i.e. when what & how much is needed so that the dog may enjoy a perfectly balanced diet. The exact quantity of food that you need to feed your dog depends on the age of the dog. As mentioned earlier the dog goes through different growth stages through its life, and its food demands change accordingly. It is, however, preferable that you feed an adult 2-3 small meals throughout the day as this is a very small dog breed and they can get ill because of the long break between meals compared to other big breeds who can live with only one main meal in a day. In the early stages of its life from (4-7 weeks – 3 months old), the dog needs to be free-fed to grow properly and get proper nutrition which is quite important in the early stage of life and pup can eat as much as it wants. This helps to prevent Hypoglycemia. In the later stage of life (3 months – 1 year) it is the right time to make a schedule to feed your dog 2-3 small meals, and that will also allow you to trace when your dog wants to go out. There is however always room for a snack. When your dog is 1-year- old, it will then be an adult, and now you can reduce the number of times you feed your dog but however now you have to increase the quantity scheduled to two big meals. 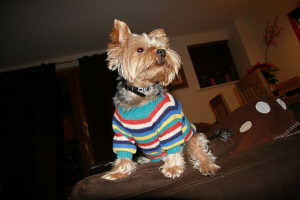 Which is More Suitable for Yorkies – Harness or Collar?